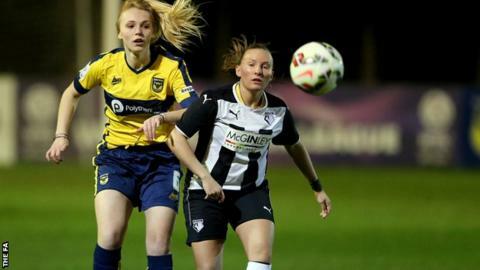 Striker Kim Farrow thinks Watford can earn a surprise win against Arsenal in Thursday's Continental Cup tie. The Lady Hornets are bottom of WSL 2, having won only one game this season, while the Gunners are second in WSL 1. Millwall currently top Watford's cup group and WSL 1 leaders Chelsea are second after rescuing a narrow victory at second-tier club Reading. "I think that result just shows that it doesn't matter what league you're in," Farrow, 23, told BBC Sport. "If you work together as a team and you play well and work for each other then anything can happen and results could go your way. "It does definitely give us a little bit of a confidence boost knowing that there isn't that much of a difference between both Super Leagues." Three-time Continental Cup winners Arsenal feature a number of established internationals, including four players who were part of England's World Cup bronze medal winning squad this summer. "I was watching some of their players when I was a little bit younger, so for us to be playing against them is a massive opportunity," Farrow added. "But it's also a chance to show what I can do - to go, you know what, I'm Kim Farrow, I can do just as much as you can. "Hopefully I get that opportunity to show it, but it's definitely exciting to play against one of the biggest teams in the country."